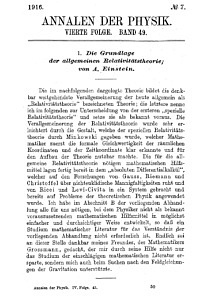 Einstein’s publication in the ‘Annalen der Physik’ urged many scientists to work. Did you know that there are five different Schwarzschild Solutions? How do you know which one is right? This article presents you three ways to check the outcome: The General Relativity Principles, the GR field equations and the Laplace operator. The outcome is surprising and disappointing: non of them is 100% correct. So there is some repair work to do. The necessity is illustrated in this article.